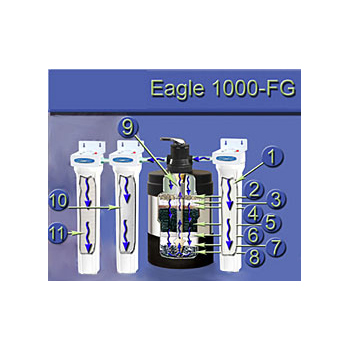 Eagle 1000-FG Budget Whole House Water Filter with tank and 3 cartridges - multi-stage filtration at bargain prices. Capable of removing hundreds of contaminants from water. Fiberglass or STAINLESS STEEL body. 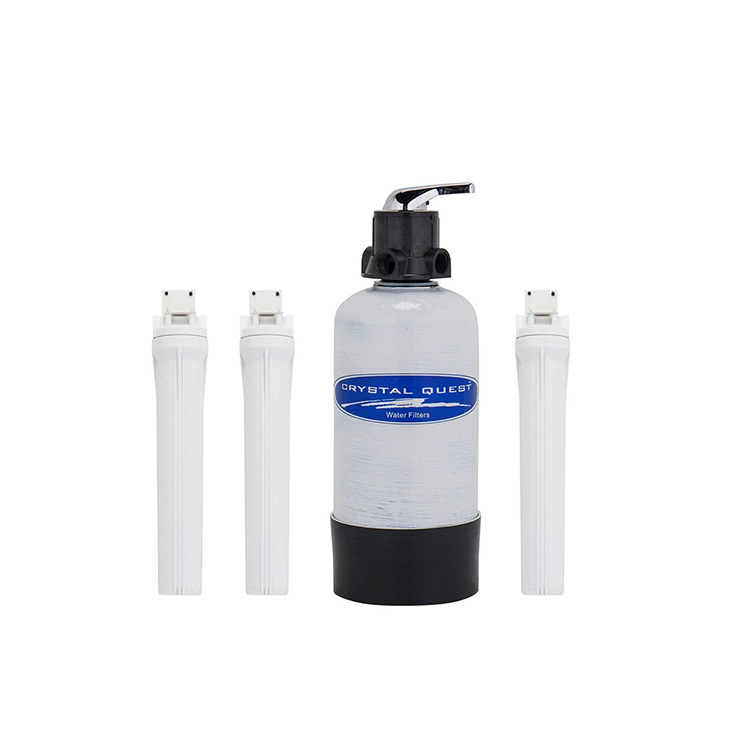 Conveniently provides up to 350,000 gallons of quality purified water. Great for small or vacation homes, apartments, townhouses and similar small dwellings with low water usage. In First stage, water flows through a 20" sediment filter cartridge that removes sediment, silt, sand and dirt. 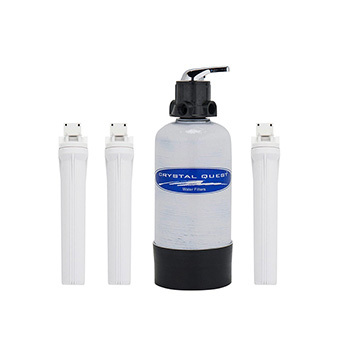 Also extends the life of the water filter and prevents damage . In stages 2 and 4,water flows through 2 beds of Redox (Oxidation/reduction process) media made of a special high-purity alloy blend of two dissimilar metals - copper and zinc. Representing a new and unique way of water processing medium which by its natural process of electrochemical oxidation/reduction and adsorption action reduces and/or remove many unwanted contaminants from water. It is a major advancement in water treatment technology that works on the electro-chemical and spontaneous-oxidation-reduction (REDOX) principles. Chlorine is instantaneously and almost inexhaustibly oxidized. Iron and hydrogen sulfide are oxidized into insoluble matter and attaches to the surface of the media. Heavy metals such as lead, mercury, copper, nickel, chromium, cadmium, aluminum, and other dissolved metals are also removed from the water by this natural process of electrochemical process. They are attracted to the surface of the media, much like a magnet. The media inhibits bacterial growth throughout the entire unit. In stage 3, water flows through the ion exchange resin, reducing heavy metals such as lead, copper, aluminum, and water hardness. In stage 5, water passes through granulated activated carbon (GAC). GAC is universally recognized and widely used as an effective adsorbent for a wide variety of organic contaminants, such as chlorine (99.9%), chemicals linked to cancer (THM's, benzine), pesticides, herbicides, insecticides, volatile organic compounds (VOC's), PCB's, MTBE's and hundreds of other chemical contaminants that may be present in water, bad taste, and odors from your drinking water. In stage 6 and 7, water travels through special blend of natural calcium carbonate medias which will alkalize/ionize and remineralizes water and raise the pH level of your water. It reduces acidity in the body and will produce natural calcium, magnesium, sodium and potassium ions that can be absorbed 100% in the human body. These Essential Minerals are vital to our organs. These are the symptoms when lacking essential minerals: Fatigue, Insomnia, Loss of Hair, Depression, Diabetes, High Blood Pressure, Asthma, Decayed Teeth, PMS. Migraines, Heart Disease (this is not a claim to cure any diseases). In Stage 8, water travels through bed of gravel. It provides backwashing support & polishes off the water. In stage 9, water flows through a powerful magnet (greater than 12,000 gauss) creates magnetic field in filter for magnetic resonance activation of the water. This process lowers surface tension, increases solubility and increases absorptivity. This process also alter the physical characteristics of water-borne minerals so they don’t cling to pipes or equipment surfaces. It also controls lime/scale build-up plumbing corrosion protection. In stage 11, water passes through a .01 micron Ultrafiltration (UF) membrane. Ultrafiltration (UF) is an important purification technology used for the production of high-purity water. UF is effective for the removal of colloids, proteins, bacteria, viruses, parasites, protozoa and pyrogens (e.g., gram-negative bacterial endotoxins), other organic molecules larger than .02 micron, and most other water contaminants known today. 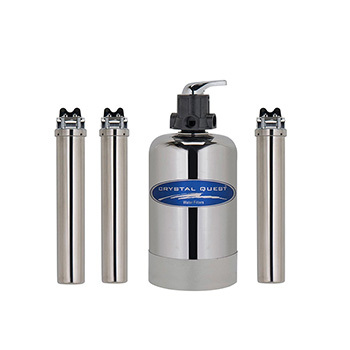 This Budget Whole House Water Filter is a great product that I have at my family cottage. It’s amazing to see how installing this improved our water drastically. I couldn’t imagine going back to a time with out it and am very pleased with my decision to have this filter unit installed. I would recommend it to anyone; it’s well worth the price!